This amazing 2 CD program by Star of "The Secret" Bob Proctor with Michele Blood is a MUST for anyone wishing to understand in detail the Law Of Attraction PLUS it gives you the Tools to begin to attract Money and Success. Money is Freedom-Freedom to live out your dreams, freedom to travel this beautiful world. 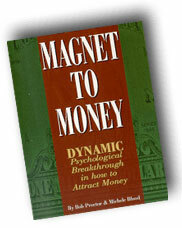 Be A Magnet to Money is one of the most simple and yet greatest psychological discoveries of the 21st century. Now through MusiVation™ you can shower your mind with the same concepts that wealthy people have studied and applied for years.